Which stakeholders lead social initiatives inside? HR and Business may be slow to take off, but they pump up the volume as time goes by! Communication and IT tend to lead at the beginning. They have been the “starter stakeholder” when it comes to social media. 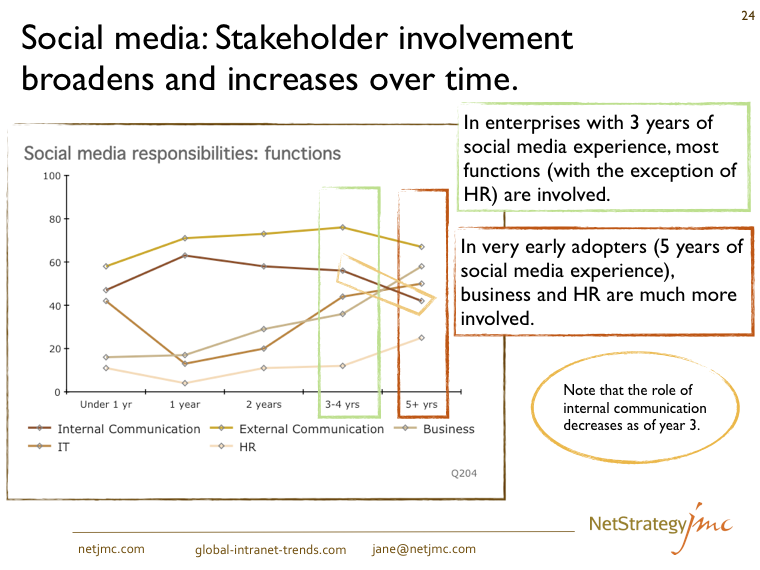 A 5-year perspective (data from the “Global Intranet Trends” 2010 survey) show that the longer the enterprise has had internal social media, the more both Business and HR are more involved. I wrote about this in January 2010 “Who has responsibility for social media in the digital workplace?” and saw that HR was one of the last stakeholders to get involved.